Hotels - De website van bcc2016! The hotels closest to the venue, unfortunately do not accept dogs in the rooms. There are several hotels at about 20-30 minutes drive from the venue that do. You can find them easiest via www.booking.com; select "Pet friendly" at the Facility Filter. You can find more information about hotel "de Brabanste Hoeve" at their website. Max. 2 dogs per room. 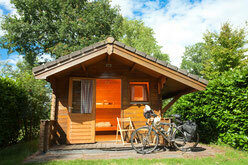 We also made a special deal with Fitland Hotel "de Vrije Teugel" in Uden. Very close to the venue and with great possibilities to take long walks with the dogs in woods and dunes. Normally this hotel does not accept dogs, but specially for the BCC2016, they make an exception. More information about the hotel at their website. Camping 't Buuteland also has 1 shack for rent during the BCC2016. This is basically a wooden tent without running water or sanitary equipment (you can use the central bathrooms and showers at the camping). 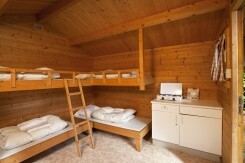 It is about 16 square meters, has bunk beds, electricity and a small stove for cooking. Maximum 2 persons and unlimited dogs. The camping has a special offer for BCC2016 participants: from 4-8 August (4 nights) for €100. Pictures and more information (in Dutch only) can be found on their website. Booking directly at the camping!